I was inspired by my green console table as well as the pretty eucalyptus I picked up at the grocery store last week. I’ve linked the new pillows on the shop my home page for you. I’m going green in other areas of our kitchen as well! 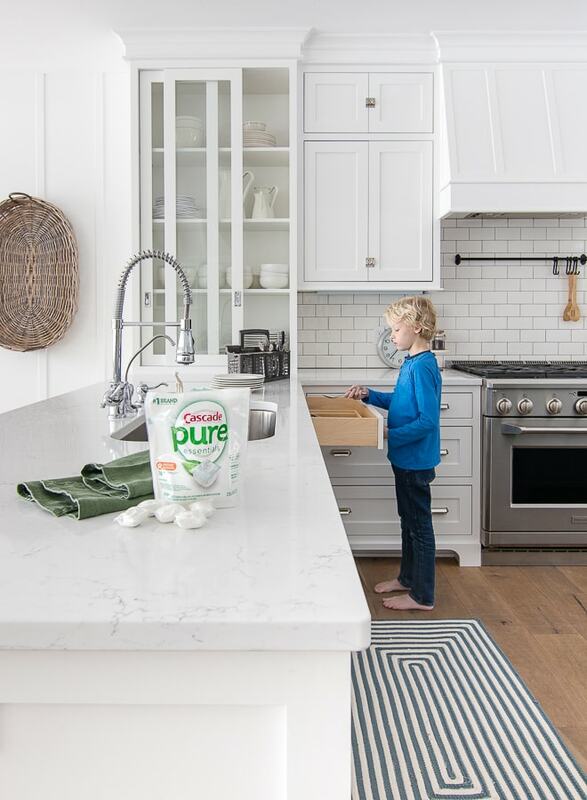 I like to buy organic foods and products that are good for me and my family whenever I can, so when Cascade asked me to partner and try out their new simplified pure essentials dishwasher detergent ActionPacs, I was excited to check them out. I’ve talked before about how awful our hard well water is in this house, and several of you fabulous readers actually suggested I try the Cascade dishwashing packs to help eliminate the hard water stains on our glasses. You all know what you are talking about (as usual) because they worked really well. I’ve been using Cascade ever since. A new simplified formula of one of my fave go-to brands seemed like a no brainer decision for my family. I’m happy to report that it tackled our hard water and stuck on food just as well. With ⅓ bio-based and other thoughtfully selected ingredients, Cascade pure essentials is free of phosphates and chlorine bleach and is Cascade’s only dye-free liquid top. This makes me feel especially great since emptying the dishwasher is at the top of my little man’s chore chart and it’s personally not my favorite chore. 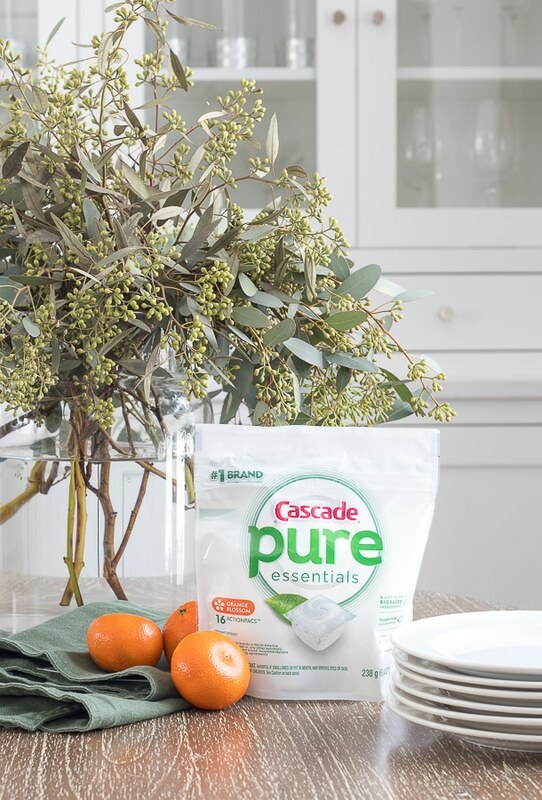 I love that Cascade pure essentials offers a dependable clean with a simplified formula without having to compromise on my normal sparkly dishes. Plus the essential oils they use in the perfumes give off a nice scent – I love the orange blossom scent and it’s also available in Lemon Essence. If you are also trying to add thoughtfully selected ingredients and products into your home, then you can head over to my Instagram for a chance to win a 3-month supply of Cascade pure essentials and a $50 gift card. That eucalyptus bouquet is so, so pretty and the green pillows really are a nice complement to your beloved blue and white. I’m still amazed by (and loving) the sliding doors on your dinnerware cabinet. Such a clever, and pretty design feature. Thanks for the heads up about Cascade Pure. I’m always happy to reduce chemicals in the house whenever I can. Thanks Dori, I still love that cabinet too! I’m the same way, anytime I can cut chemicals out it makes me happy. love your new pillows… do you use those ;little packs in place of the dish detergent or in addition to? we have hard water over here too ;-( thx for the help. Yep just use them in place of regular detergent, they are so easy to pop in! I am going to give these a try! Love the more natural ingredients and I’m always a fan of any citrus type scent. The pops of green in your home are lovely- good job as usual! Might I suggest a water softener? I have hard water in both my homes in Illinois and Michigan. It does make a big difference on every glass shower and every faucet in my house. We bought our water softener at Menards (WaterBoss) and installed it ourselves. And for those who think it puts salt in the water….not true…..
Hey, Cindy yes we have a water softener it just doesn’t really do the job altogether, unfortunately! I live in rural Iowa and my family and I have been in our new construction house for not quite a year. We have also had trouble with our water quality and recently switched to a Kinetico water softener (about 3-4 months ago). The improvement has been amazing! It is more expensive, but worth it in my opinion because our water quality is always great. The Kinetico system has two tanks, which allows you to always have water that has been cycled and is ready to use. Most systems only have one tank and can’t always keep up with the water consumption. We even had a problem with rust for awhile and had orange water coming out at times, but the Kinetico softener has completely taken care of that as well. Geez! I sound like a sales rep for their company! Anyway, I just wanted to pass that info. on to you. Thanks Becky, I’m not sure what kind of softener we have but I’ll check it out! I really appreciate the recommendation! I LOVE accenting with green. I don’t know of a better color that is a reflection of nature…other then possibly blue. Thank you so much for the recommendation of Cascade Pure!. We live in a suburb of Grand Rapids that has well water and septic systems. We have a water softener but the glasses end up with hard water stains. Chlorine is really bad for septic systems since it destroys the bacteria they need to work properly. To finally find one that doesn’t contain it is SO great. I didn’t know about Chlorine and septic systems great tip! LOVE the touch of green with the blue & white!! 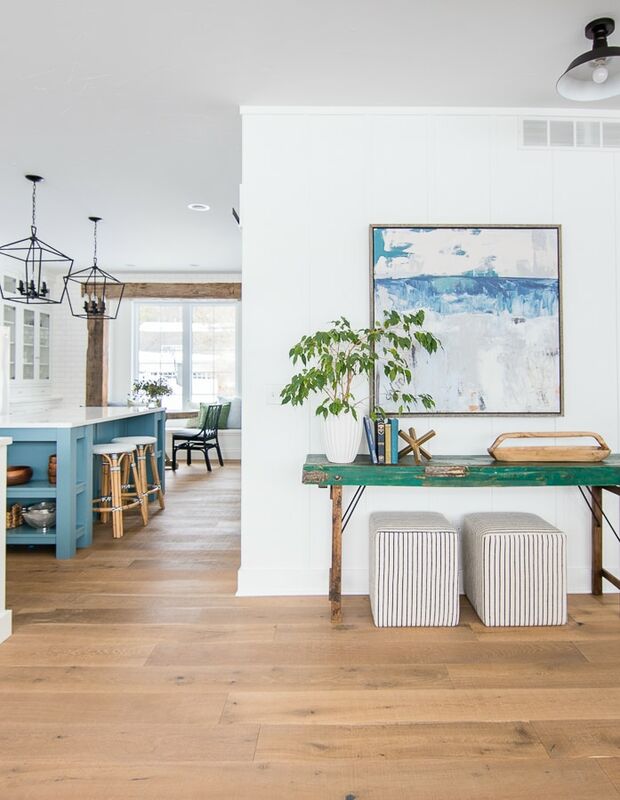 By chance, do you have a link for the painting above the green console table? Or is it a DIY? Hey Melissa this is a print from DeAnn Hebert. If you google her you should find her online shop and this print it’s from her Beach Series – thanks! I LOVE the touch of green. 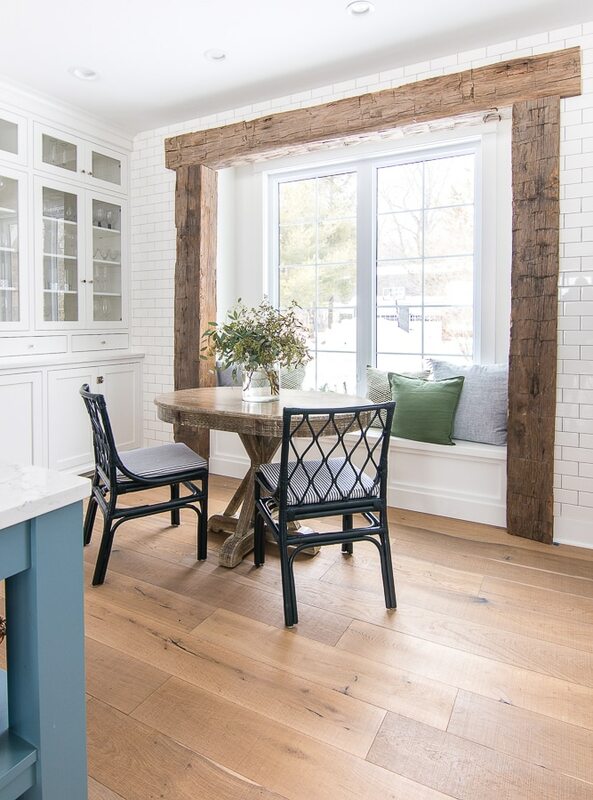 The photo showing your console table and breakfast nook is stunning. I stumbled across your blog over a year ago when finalizing designs of my lake house. My husband and I fell in love with your home and I have to admit based our family room very much on yours AND I bought the same lights for our kitchen. My home wouldn’t be as beautiful as it is without inspiration from your blog and others. THANK YOU! Oh that’s so fun Kelly thanks for sharing! This totally made my day! Soooo pretty! Info on your countertops please…..are they Quartz Willow White? They are Quartz by Vicostone the color is Mysterio thanks! I have that pillow cover – from H&M? Love their covers – the prices are great and they’re usually natural fiber. 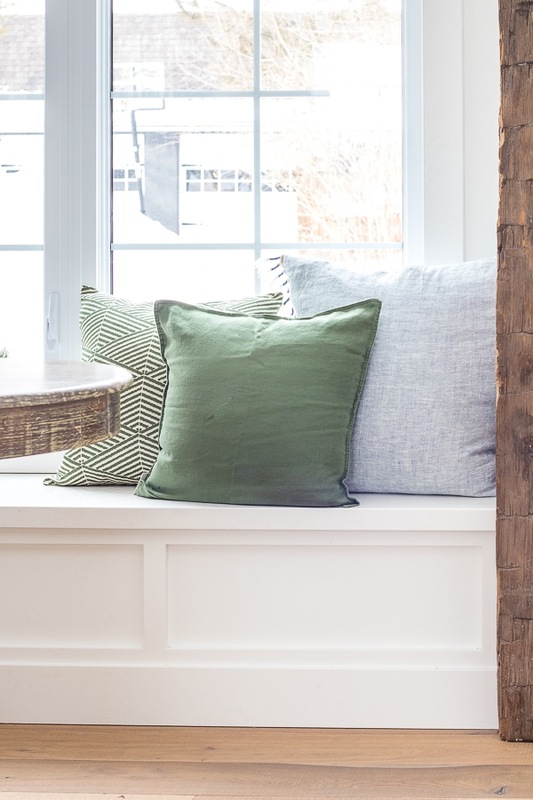 I use a church pew along one side of our 9-ft dining room table, and need lots of throw pillows to soften the hard wood; H&M covers are inexpensive enough that I can swap covers on 5 or 6 pillows seasonally! Yes love their covers for swapping seasonal decor!